The Ribbon in CommonLook Office has some important options that are explained below. CommonLook Office includes several preference settings to help manage PDF output and assist users. 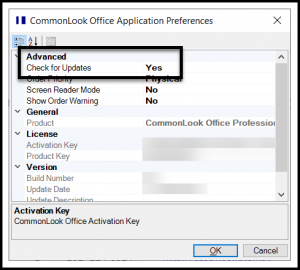 Select the CommonLook Office Preferences tab in the ribbon to explore the options and change settings. Check for Updates: Checks the CommonLook Update Server for newer releases. Once a new release has been detected, it offers to download and install the newer release. The default is set to “Yes.” Read more below about automatic updates for CommonLook Office. Set “Check for Updates” to “No” if you don’t want CommonLook Office to automatically look for updates. Tip: If you set “Check for Updates” to “No,” use the “Check for Updates” button on the ribbon to manually find out if there are updates available. If you use the “Check for Updates” button on the ribbon and learn that there’s an update available, CommonLook Office will ask you if you want to download and install it. 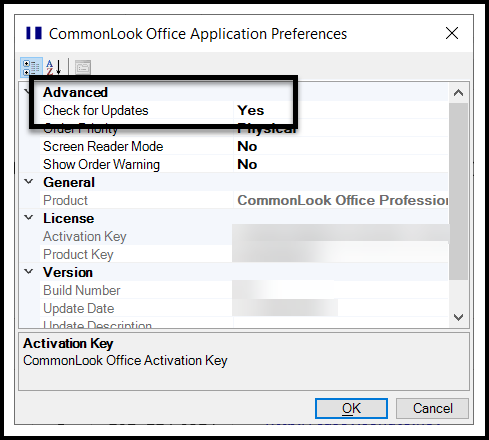 Screen Reader Mode: If using CommonLook Office with a screen reader, change this setting to Yes in order to disable the selection of document elements while running CommonLook Office and improve the user experience. If you are not using a screen reader, this setting should be No. Show Order Warning: When set to Yes CommonLook Office displays a warning when it reorders content (refer to the Order Priority setting, above) to ensure correct behavior in Adobe Reader’s Reflow mode. If you get this warning, please examine the pages indicated in the output PDF file for either reflow or visible errors, as indicated.